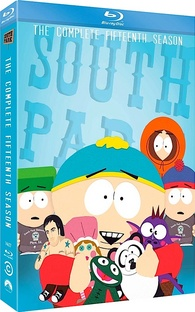 The most recent wave of episodes for the hit Comedy Central animated series is coming to Blu-ray at the end of March. In an early announcement to retailers, Paramount is working on 'South Park: The Complete Fifteenth Season' for a high-definition bow on March 27. The two-disc set will contain all 14 episodes in 1080p with a Dolby TrueHD 5.1 soundtrack and supplements will include Behind-the-scenes featurette on "City Sushi", Comedy Central documentary 6 Days to Air: The Making of South Park, and deleted scenes. Suggested list price for the Blu-ray set is still undetermined at this time. You can find the latest specs for 'South Park: The Complete Fifteenth Season' linked from our Blu-ray Release Schedule, where it's indexed under March 27.